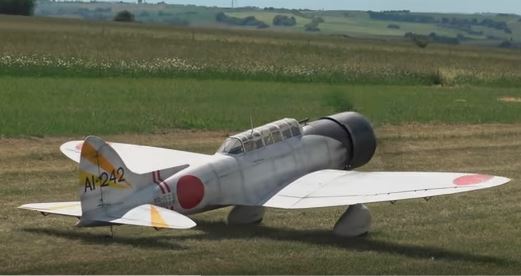 You don’t often see an RC version of the Japanese Aichi D3A (called “Val” by the Allies), let alone a monster scale version. This impressive Tora Tora Tora “torpedo bomber” is a real stunner and the work of Jörg Albrecht. At a massive 1/3.2-scale, the Val weighs in at 147 pound, and it has a 14.5-foot wingspan. Powered by a Valach VM R420cc, 4-stroke, five–cylinder radial, it has power to spare. Thanks to RCGiantScalePlanes for taking this video at the Icare Airmeet. That’s a moose! 420cc radial. 147 pounds. Wow. Great job to Jorg! Very nice plane, and looks so smooth when flying. Awesome video. Awesome plane! Wonderfully scale ground-handling and aerobatics. And nothing beats the sound of a radial engine. Weathering looks like the plane’s been riding a carrier for awhile or parked in the jungle under a cammo net! Too bad you will never see it in the USA. thanks FAA and AMA!! If you were motivated to do some research it is possible to fly a plane this size in the US. There are no provisions for it to be flown in AMA competition but non the less it could be flown here in the USA. Do you think this guy just showed up to fly without jumping through a bunch of hoops? A look over the European requirements is extensive and has onerous inspection and flight test programs. Being allowed to fly here in the US would seem a walk in the park comparatively. I enjoyed the video, He flew in a non scale manner the full size plane would never fly the maneuvers he performed. The excess power to weight allowed that capability. I flew a demo in Germany in 2009 With A USRA Unlimited race plane. My plane had to go through an inspection prior to flight and had to get several waivers for non compliance with their rules including a noise waiver. You beat me to the punch Mike. I was going to point out that the Aichi Type 99 “Val” was a dive bomber and not a torpedo bomber.